Ott Tänak (M-Sport Ford) captures his second WRC victory in a career by winning the 35th ADAC Rallye Deutschland, the tenth round of the 2017 World Rally Championship. Andreas Mikkelsen reached a podium in his third drive in a Citroen C3 WRC, ahead of M-Sport’s Sebastien Ogier. 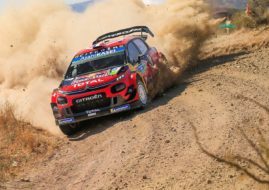 The reigning world champion is the championship leader again following disappointing result of his main rival Thierry Neuville, who retired on Saturday morning with damaged car. Neuville returned to action on Sunday, trying to get some points on the Power Stage but he failed, leaving Germany with the same amount of points he had before. Neuville was just one of many drivers who experienced problems in changeable weather conditions and muddy asphalt roads. Kris Meeke crashed out on the very first special stage, started again on Friday and retired again due to mechanical problems after SS14. Dani Sordo crashed out on SS4 while his teammate Hayden Paddon suffered punctures few times. Toyota drivers Jari-Matti Latvala and Esapekka Lappi also had lots of problems and finished far away from the top. Ford drivers Tanak and Ogier had no major problems, just slight off-road excursions, securing third double podium for M-Sport this season. The team remained in the lead of Manufacturers’ standings. Dani Sordo: Where is my car? Juho Hanninen (Toyota) finished in the fourth place, more than a minute behind third-placed Ogier. Craig Breen (Citroen) and Elfyn Evans were fighting for P5 until the last stage. At the end, Irish driver in Citroen C3 was 1.9 seconds faster than Welshman in Ford Fiesta. Jari-Matti Latvala (Toyota) finished in the seventh place, ahead of Hayden Paddon (Hyundai). German rally veteran Armin Kremer finished ninth in his debut with new-generation Ford Fiesta WRC. Eric Camilli (Ford Fiesta R5) was the best WRC-2 driver and tenth overall. It’s interesting that ten drivers recorded fastest times in 21 special stages during four days of the event. On Thursday afternoon, WRC2 driver Jan Kopecky surprisingly won the superspecial on the streets of Saarbrücken. On Friday, stage winners were Dani Sordo, Ott Tanak (three times), Andreas Mikkelsen, Thierry Neuville and Jari-Matti Latvala. Juho Hanninen and Sebastien Ogier put their names on the list of stage winners on Saturday while Esapekka Lappi and Craig Breen won one stage each on Sunday. On the last stage of the event, the 12.95-km Power Stage, Dani Sordo was fastest, earning five points. Other points scorers were Lappi, Latvala, Ogier and Breen. In the WRC-2 class, Škoda Motorsport’s Pontus Tidemand finished third in Germany to secure championship title. The category winner in Germany was Eric Camilli (Ford), ahead of Jan Kopecky (Škoda). Junior WRC and WRC-3 drivers also competed in Germany. Julius Tannert took victories in both categories with Ford Fiesta R2T. The next WRC event is the 53rd RACC Rally Catalunya – Costa Daurada, scheduled for October 6-8.